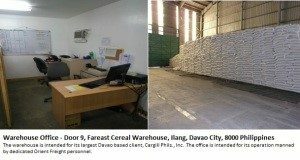 Orient Freight Cebu headed by Mr. Michael Igot (Cebu Branch Manager) expanded its scope by developing business opportunities in the largest City in the world, Davao City. The planning stage begun in the early 2016. Taking into consideration, the economic boom of the region representing the numerous infrastructure project linking the trade between surrounding cities and municipalities. Added to that, the ever-expanding agriculture business the region is known for. August 1, 2017 marks the beginning of Orient Freight International Inc. in Davao with two separate offices. Davao operation also expand to the neighboring cities and municipalities including General Santos City.